You’re absolutely right, Dave. It’s rare to even find a bus shelter/stop that has any indication of which lines stop there, much less a route map. 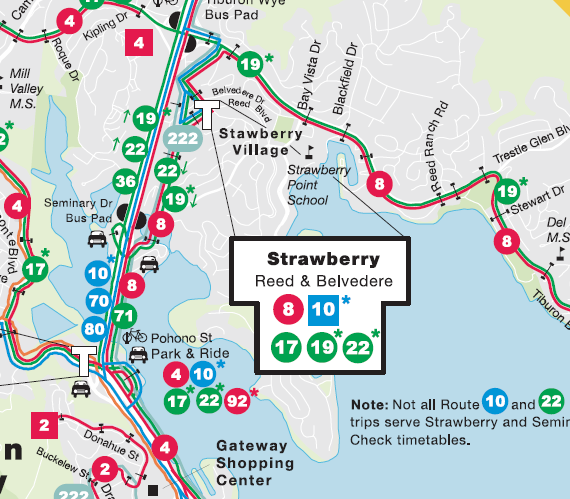 Marin Transit’s explanation is that routes change too quickly to provide such current info, but this is why occasional transit users give up. Why would they change it so much anyway? How am I, the bus rider, supposed to know how to get from A to B if the route keeps changing? I don’t want to check 511 every flippin’ time I need to take the bus stop on the off chance there’s a service change. Terrible terrible terrible. I think I’ll crib from a local DC transit agitator and call this series UnsuckGGT.